“Rebel Hill, Artist's Drawing,” braddockheritage.org/, accessed April 24, 2019, http://braddockheritage.org/items/show/214. On March 29, 1962, The Washington Post reported testimony by Mrs. Z. C. Zefteris of Kings Park West about Rebel Hill on Braddock Road to the Fairfax County Board of Supervisors. 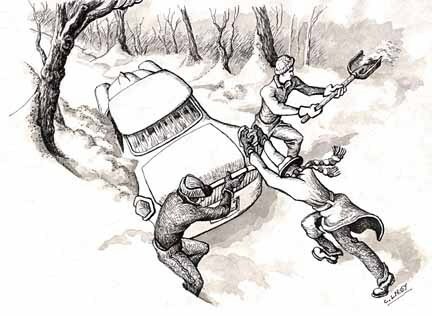 Describing cars sliding off the steep road in icy conditions and the inability of women to walk up the hill to call for help, she is quoted: "They had to go up that hill on their hands and knees..."
Artist Chris Lipsey depicts what it might have been like for drivers in winter.